Could this impact the iPhone 8? Qualcomm wants to ban the import and sale of iPhones in the United States and is asking the US International Trade Commission (ITC) to conduct an investigation into alleged patent infringement, the company announced today. This is the latest yet by far most serious development in an ongoing legal dispute between the chip maker and Apple. The two have sued and counter sued one another this year, and Qualcomm is taking the next step by getting the ITC involved. Qualcomm, which has silicon in a broad swath of consumer electronics, wants iPhones that it says infringe on one or more claims made in six patents banned from being shipped to the US. The company is also asking the ITC to investigate which iPhones house chips made by Qualcomm competitors, namely Intel. Qualcomm expects the investigation to commence in August with a trial to begin next year. Qualcomm claims its infringed tech enables high performance while extending iPhone battery life. It even made an infograph to show how Qualcomm tech is used in iPhones "everyday." 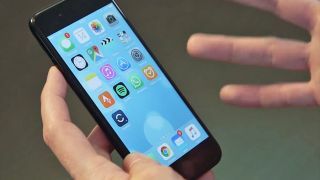 The company also wants an order to be issued "barring further sales of infringing Apple products that have already been imported and to halt the marketing, advertising, demonstration, warehousing of inventory for distribution and use of those imported products in the United States." "Apple continues to use Qualcomm's technology while refusing to pay for it," said Don Rosenberg, executive vice president and general counsel of Qualcomm, in the company's release. In addition to its planned ITC filing, Qualcomm also filed a complaint with the US District Court for the Southern District of California regarding infringement of the six patents. The court will likely stay the case until the conclusion of the ITC's investigation. If the case isn't stayed, it should go to trial in two years' time. We asked Qualcomm whether it's in discussions with Apple to settle the dispute outside of court, but the company declined to comment. We asked Apple the same thing, as well as how a ban would impact iPhone sales, and will update this story if we hear back. Could a ban impact the iPhone 8? Qualcomm is taking a bold step in seeking an iPhone import and sales ban, however it's unclear how many iPhones would ultimately be affected. That's a figure the ITC would help determine in its investigation, if it decides to take the case and finds infringement. It's also unlikely a ban would impact the highly anticipated iPhone 8, or at least not immediately. The trial wouldn't begin until next year, and if the ITC finds for Qualcomm, an injunction order typically goes into effect 18-21 months after the complaint is filed. While Qualcomm is seeking a halt to alleged infringement, damages and injunctive relief, it's unlikely Apple will sit quiet for much longer. Whether this means a counter suit or other measure is in the works, we don't yet know, but we'll provide updates as this case develops.